latakoo is an enterprise video transfer solution that lets you send high quality video securely from any Internet connection. Companies like Nexstar Broadcasting and the American Farm Bureau are using our one-click compression, super-fast uploads and searchable video archive. Joining them will save you money and make managing your video assets simple. Drag, drop, click. That's all you need to do to upload your video from anywhere with an Internet connection. Because the videos are compressed to a fraction of their size before upload, transfers are fast and easy. We handle most video formats, and do the hard work for you. 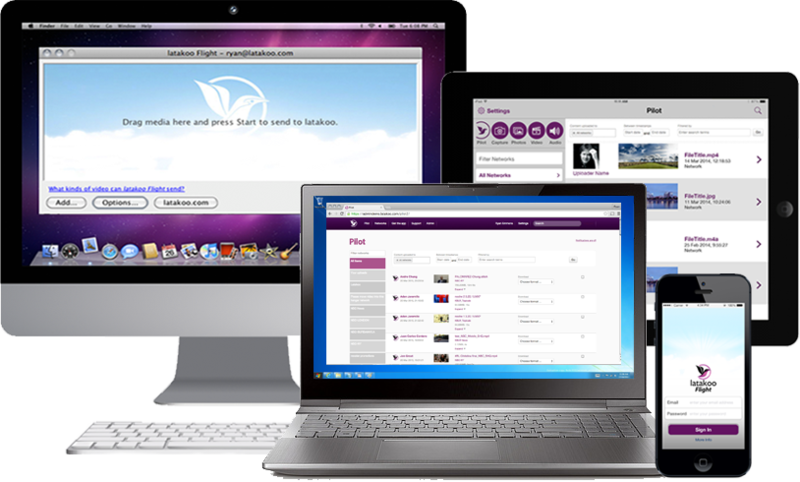 The latakoo Flight app is free for Windows, Mac, iPhone and iPad. That means you can let exactly the people you need send video to your latakoo account. We get that you want to manage your video on your terms. Out of the box, latakoo has a great interface and integrations with some of the biggest names in online video and file storage. If you need something more, we're here to help. We'll integrate with your systems, customize our look and feel - even change the data we collect. All backed by fantastic support, so you're never on your own. Tag it, add a transcript, share comments and download your video in a variety of formats. All from any web browser. We'll give you plenty of video storage space, so all your video can be there - anywhere - when you need it. latakoo's enterprise plans contain fine-grained access permissions, so you can share your video with the people who need to see it, without having to publish it to the world. We want to learn more about what you need. Enter your details below, and we'll get in touch to arrange a demo. latakoo has to be seen to be believed. Just to avoid bots: what is 1 + 1?